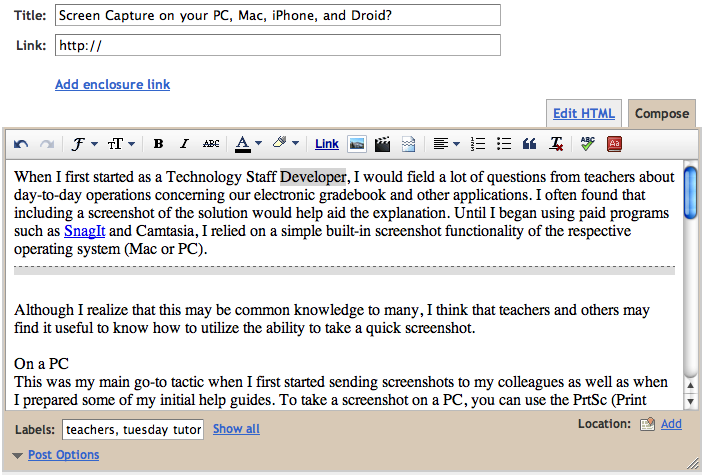 Screen Capture on your PC, Mac, iPhone, and Droid? When I first started as a Technology Staff Developer, I would field a lot of questions from teachers about day-to-day operations concerning our electronic gradebook and other applications. I often found that including a screenshot of the solution would help aid the explanation. Until I began using paid programs such as SnagIt and Camtasia, I relied on the built-in screenshot functionality of the respective operating system (Mac or PC). Although I realize that this may be common knowledge to many, I think that teachers and others may find it useful to know how to utilize the ability to take a quick screenshot. This was my main go-to tactic when I first started sending screenshots to my colleagues as well as when I prepared some of my initial help guides. To take a screenshot on a PC, you can use the PrtSc (Print Screen) button on the keyboard, usually located in the upper right. Depending on the keyboard, you may need to press function (Fn) or shift in addition to the PrtSc key. You now have the screen on your clipboard. Next, you'll need to place it somewhere. If you have an image editor, you can paste it (Ctrl-V) directly into the program. I often chose to use MS Paint, found in Start, All Programs, Accessories. You can do some minor manipulations here, but often I just re-sized and saved as a .PNG to use in documents and/or an email. As is often the case, the Mac version of this feature involves fewer steps and more built-in functionality. To take a screenshot of your entire desktop, use the Command-Shift-3 combination. You'll hear a shutter sound, and a .PNG image file will magically appear on your desktop. The hardest part is remembering the keyboard combination. Let's try this - repeat after me: "For screenshots without a fee, use Command-Shift-3!" Ouch. But wait, it gets better. Suppose you wanted to just capture a portion of your screen. There's a keyboard shortcut for that! Simply press Command-Shift-4 and a cursor will appear. Click and drag the cursor to create a window for your screen capture. Let go, and you'll hear the familiar shutter sound followed by the image appearing on your desktop. "Since less is more, use Command-Shift-4." OK, enough already. Believe it or not, there's even more functionality on the Mac in addition to tons of shortcut combinations. Check them out here if you get a chance. For those using the iPhone (2.0 and above), the device has a built-in screen capture function. Simply hold down the home button and then press the top button, and you'll hear the shutter sound. The screen shot will be placed in your camera roll. For those using Android phones, unfortunately, this functionality does not seem to be built into the OS. There are ways (rooting and non-rooting), but hopefully, a more user friendly way will be included in future updates.